Our "Wildcard" Vegas Adventure was a thrill for Naturally Quartet! Special thanks to all of Region17 for your well-wishes, cards and generous Love Gifts. We thank you all for helping us to enjoy the Journey with our Regional Quartet Champions, "SureFire", and Chorus Champions, "Grand Rapids"! Naturally Thanks "YOU", Region 17! Naturally had a great time celebrating the 40th Birthday of Region 17! Naturally wishes to thank Region 17 for all of their love and support during our Regional Contest weekend. We Congratulate Surefire Qt on their Championship performance, and all Region 17 Quartets, who put their best performances on stage! Twenty Quartets!! Way-to-go Region 17! 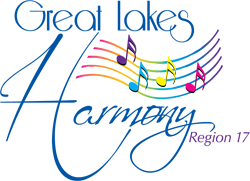 And now, we'll be getting ready to represent the Region as a Wildcard competitor in the Quartet Contest in LasVegas this Fall; sharing the stage with Surefire Quartet, and The Grand Rapids Chorus; how exciting! "Naturally would like to first thank all that have supported us on this journey. As many of you know, for the past year Beth Gutowski, "Beth the Baritone" has been battling ovarian cancer. Her bravery and determination have been unmatched as she has faced this. Beth has taken the stage for performances and competitions through great circumstances. And, we have admired and loved her for it.